This cake got rave reviews. One "feel free to make this cake every year for my birthday" and one "the best cake I've ever eaten". That's pretty good for an easy cake like this one. 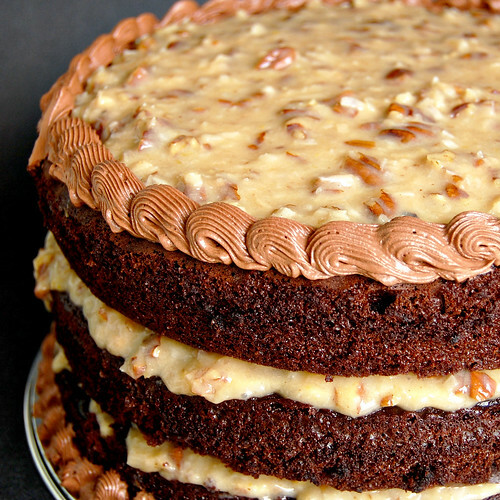 It's just a double recipe of my go to chocolate cake and Baked's filling recipe for German chocolate cake. Even the chocolate frosting was a hit. I was so embarrassed to admit that it came from a can... But I wasn't going to make a frosting just to pipe around the edge of the cake. And I will admit that I actually like frosting from a can! The chocolate cake is super moist and chocolaty. The filling tastes like caramel with toasted coconut and pecan in it. Actually, really, really good. The frosting added just a tiny bit of a creamy element. 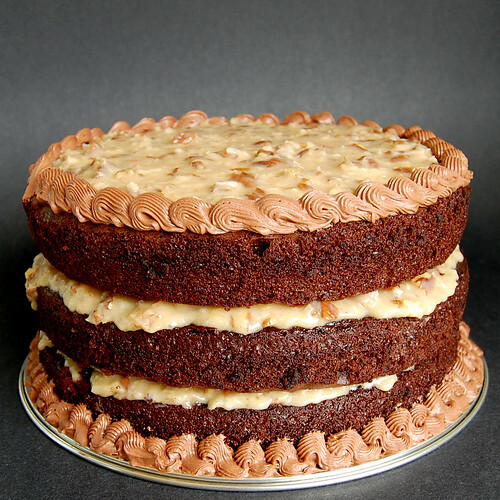 The chocolate cake recipe yields three 9-inch round layers, and 8 cupcakes. One of these days, I'll scale down the recipe to make only the three layers I usually need, but in the meantime, extra cupcakes in the freezer is never a bad thing. Preheat oven to 350 degrees. Line the bottom of three 9-inch baking pans with parchment paper and lightly oil the sides, set aside. Put cupcake liners in a muffin tin. In the large bowl of a standing mixer, stir together sugar, flour, cocoa, baking powder, baking soda, and salt. Add eggs, buttermilk, melted butter and vanilla extract; beat 2 minutes on medium speed. Pour batter evenly between the three pans and bake on middle rack of oven for 30 to 35 minutes, until toothpick inserted in centre comes out clean. Pour the rest of the batter in cupcake liners, and bake 25 minutes. Cool completely on wire racks before frosting. I mentioned before how amazing this cake is, but it's worth repeating: one bowl. no extra prep. no dome = no trimming the top. cake shrinks from the edges of the pan a little as it cools, so no worries about the cake not coming out of the pan in one piece. super moist and yummy... seriously... the perfect chocolate cake! I'm not really good at dividing stuff just by eyeballing it, so I almost always weigh the batter as it goes in the pans, so that my cake layers come out even. For this cake, I pour 1 pound 11 ounces of batter in each of the cake pans, and use the rest for the cupcakes. I do the same for the fillings. 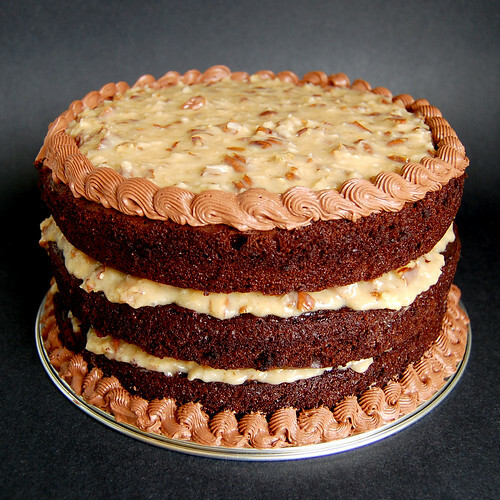 For the coconut pecan filling, 10.5 ounces went between each layer and on top of the cake. Preheat the oven to 300. Line a baking sheet with parchment paper. Spread 1/2 cup plus half of 1/3 cup measure of the coconut evenly across the pan and place in the oven for 5 minutes or until the coconut begins to brown. Remove from the oven and cool on a wire rack. In a large saucepan, stir together the sugar, butter, evaporated milk, vanilla and egg yolks. Bring the mixture to a boil, stirring constantly. After the mixture begins to boil and thicken, remove from the heat and stir in the toasted coconut, 1/2 cup plus half of a 1/3 cup measure of the regular coconut, and pecans. Place the pan over an ice bath (a large bowl filled with ice) and stir the mixture until cool. Place one layer of chocolate cake on a serving platter, then 1/3 of the coconut and pecan filling (spread not quite to the edges so the filling doesn't drip all over the side of the cake), another chocolate cake layer, another third of the filling, the last layer of chocolate cake and the leftover filling, not quite to the edge, so you can pipe on the chocolate frosting border. We had a big pizza dinner before the cake, so I only cut small slices, and half the cake served 7 adults and 4 tiny kiddos. It's a good thing it was enjoyed, because there are a lot of leftovers! Happy Birthday Doris, and I'm glad you liked the cake! Literally drooling here. I have to say I just recently found you, and I am in total LOVE with your blog. Wonderful! What brand of canned chocolate frosting did you use? @Procrastobaker - thanks for the great comment! Did you use dutch-processed cocoa? Thanks! Yes, that's what I keep in the cupboard. If I halved this, would it be enough for an 8" cake? And do you think it would be 2 or 3 layers? Thanks! ... but she doesn't do the dishes. Bourbonnatrix bakes for her husband and her two daughters near Ottawa, Ontario, Canada. She has a communications job in the education sector. She likes to bake. Thanks for visiting. Hope you like what you read. I'd love for you to comment on my posts, or contact me by email at bourbonnatrix (at) yahoo (dot) com and let me know what you think. Looking forward to reading you! here's a neat way to see a picture from every single post on one page! Want to receive my posts by email? BROWSING? WHAT ARE YOU HUNGRY FOR?